Grew up… in poverty. Charlie’s family never had very much money, but that didn’t prevent him from following his dreams. Visiting… Willy Wonka’s mysterious factory. 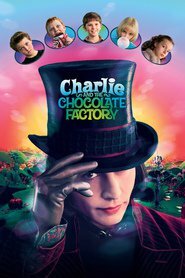 Charlie and four other children have been lucky enough to win a contest granting them a tour of the factory, led by the eccentric Mr. Wonka himself. The winner among the five will also receive some undisclosed grand prize, though nobody is quite sure how one “wins” – or what. Interests… candy, like many children. Charlie, though, is not spoiled or gluttonous. Due to his family’s dire financial situation, he’s only allowed one piece of chocolate per year, on his birthday. Relationship Status... single. Charlie is still a little too young to worry about dating. Though having special access to a chocolate factory won’t hurt his cause. Challenge… winning the ultimate contest and making it to the end of the tour. The other children on Wonka’s wild and wondrous tour are having trouble following the rules. Charlie is the only one who seems to be making a good impression on Willy Wonka. Charlie Bucket's popularity ranking on CharacTour is #1295 out of 5,000+ characters. See our top-ranked characters and read their profiles.